Hi there, and welcome to my review of the Bushnell Tour Z6 Jolt Laser Rangefinder. Even though this product is designed with golfers in mind, I’ve found that many such models are still great for hunting purposes. So, I was eager to give the Tour Z6 Jolt a test drive and see how well it would perform on a deer hunt. Here’s what I found out. The best part of the included accessories is definitely the carrying case, because it includes a carabiner attachment loop that allows you to hook the case onto anything you want. How Far Can The Tour Z6 Jolt Range? This particular rangefinder can judge distances of up to 1,300 yards, which is probably further than most folks will try hunting from. Bear in mind, that’s just the maximum range for large, highly reflective targets. Your average (or even your not-so-average) deer doesn’t count, so expect it to get your range to target from about 500 yards. Accuracy is within plus or minus a half yard for up to 125 yards, and is within a yard beyond that. When you’re ranging a target up to 125 yards away, the device provides precision of 1/10 of a yard. With 6X magnification, you’ll be able to get up close and personal with that deer you’re looking to fill your freezer with. This rangefinder is exceptionally easy to use, simply because there aren’t any extraneous modes to turn on or off. You just press the red power button once to turn the device on, and then press and hold that same button when you want to activate the laser. This model has fully multicoated optics for an outstanding image with plenty of light, and the 21mm objective lens greatly improves transmittance. Through this rangefinder, you’ll enjoy a generous 393 field of view, which is plenty of space to locate your target and then range it. Eyeglass wearers, beware, however. The limited 16mm eye relief makes using the rangefinder difficult when wearing spectacles. This model does, however, include a diopter adjustment of plus or minus two diopters. This device, like most of its kin, is powered by a CR-2 lithium battery. Bushnell includes one in the box, but you would be well-advised to buy a spare to carry with you in the field. While the Tour Z6 is great on power consumption, the rarity of these batteries will make things a challenge for you if you try to find one in the rural areas that we hunters tend to frequent. While this is definitely a great little rangefinder, it does have some limitations. You won’t find any of the extra features that hunting-designed rangefinders come with, such as different targeting modes. You also won’t find any slope compensation in the range return. 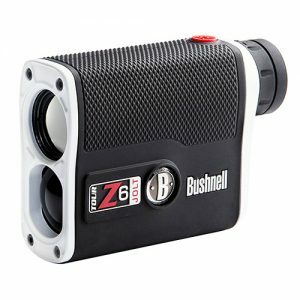 What you will enjoy is the E.S.P.2 technology Bushnell has built into the Tour Z6 Jolt. 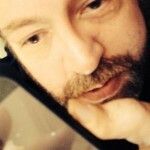 It allows the device to return your range lightning fast, so you don’t waste any time getting your range to target. Another great feature is the Vivid Display Technology, which allows the rangefinder to switch between black and red readout colors depending on user preference and lighting conditions. What’s the Light Gathering Capability Like on the Bushnell Tour Z6 Jolt? Thanks to its large 21mm objective lens and the fully multicoated optics, this rangefinder provides terrific transmittance. You’ll be able to see your target even in low lighting conditions, and the Vivid Display Technology makes the readout a pleasure on the eyes even during twilight hours. The optics on this model are better than I expected, since they’re fully multicoated in a market that’s dominated by manufacturers that only multicoat their optics. The focus is also superb, snapping your target into a sharp, detailed image within the blink of an eye. This rangefinder, other than the short eye relief, is definitely a pleasure to use. Bushnell has built this rangefinder to last, with a metal housing that’s encased in rubber armor. It’s shockproof, so you don’t have to worry about short drops damaging the unit. It’s also complete with O-ring sealed lenses and a nitrogen-purged optical chamber, making the device both fogproof and waterproof. Thanks for reading my review of the Bushnell Tour Z6 Jolt Laser Rangefinder. As long as you don’t wear glasses, this device is almost the perfect little rangefinder for simple use. If you want slope compensation or a long eye relief, however, you should choose a different model.